10 November 2008, at 8:58a.m. AUSTRALIA - The Department of Agriculture and Food has created a new position - Animal Welfare technical officer - to help livestock industries to develop preventive strategies in animal welfare risk areas. Department of Agriculture and Food Animal Welfare technical officer Charlotte McIntyre (pictured with her horse, Topov) will work with livestock industries to assist them to develop preventive strategies in risk areas such as long-haul transport. Animal Welfare project manager Tony Higgs said the technical officer would work closely with industry to advise on reducing welfare risks in livestock production and specific areas such as long-haul transport. Charlotte McIntyre has taken up the new position, based in Albany. “Ms McIntyre has 15 years of practical animal welfare experience gained in both the United Kingdom and Western Australia,” Mr Higgs said. “Her skills, passion and enthusiasm for animal welfare are well recognised in the livestock industry. Ms McIntyre began her working life on beef and sheep farms in Wales in 1988, and completed a three-year Diploma in Agriculture at the Welsh Agricultural College in 1990. 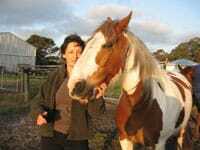 She was an RSPCA inspector in the UK for nearly 10 years and in Albany, Western Australia for five years before joining bluegum plantation company Timbercorp as a Public Relations/Communications Officer in 2007.